A bright studio flat situated on the second floor of an impressive Victorian building in a quiet and residential street close to Hammersmith and Shepherd’s Bush tube station. The property comprises a studio room, kitchen and a shower room. 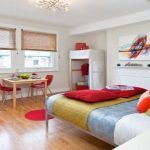 The apartment is well located and is close to local amenities, the central line and Westfield Shopping Centre, with its extensive transport, shopping and restaurant facilities. Lena Gardens is a residential street which runs west of Shepherds Bush Road. There are a variety of local shops and restaurants and underground stations include Hammersmith Broadway (Piccadilly, District and Circle Lines), Shepherds Bush (Central Line) and Olympia (District Line and Overground).